Occasionally, a puppy may reach 8 weeks of age without having both testicles descend into the scrotum. This condition is called cryptorchidism, or retained testicles. Cryptorchidism is a genetic condition that is passed on from father to son in dogs, and puppies with retained testicles should be neutered to eliminate the trait. It is important that this condition to be treated to prevent the development of testicular cancer, and neutering is the best choice for your pet. Ask your veterinarian or a dog breeder at what age the testicles should have descended. The time of testicular descent varies among different breeds. 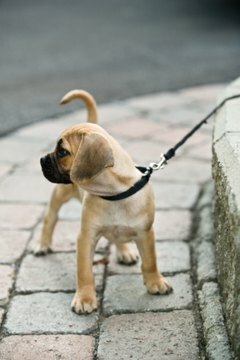 If the testicles have not descended by 8 weeks of age, the puppy may be tentatively diagnosed with cryptorchidism, but it cannot be definitively diagnosed until the animal has reached puberty. Take the puppy to a licensed veterinarian to verify that the testicle has not descended. It is not always visually apparent when the testicles have descended, and palpitating the scrotum to find them takes practice. Weigh your options. It is not recommended that cryptorchid animals be bred, because the condition is inherited, and so the best option may be to have the animal neutered, in which case the veterinarian will remove both testicles. Alternatively, if you are determined to breed the animal, you can arrange to have the veterinarian surgically descend the testicle. Hormone therapy is also sometimes used, but there is little scientific evidence that this treatment is effective. Both surgery and hormone therapy are considered largely ineffective, as well as unethical by veterinarians, breeders and showers. Inducing testicle descent artificially is considered unethical because it is a hereditary defect that has serious medical implications for the affected animal and its offspring, who will either be affected or be carriers for cryptocorchidism. It is also unethical from a business viewpoint -- having a dog's testicles surgically corrected deceives show judges, prospective breeder clients and prospective buyers into thinking that the animal is physically and genetically sound when it is not. Overall, helping to descend testicles in puppies cannot be recommended, but either way, the advice and assistance of a qualified veterinarian is of the utmost importance. Sachiko Schott has been writing since 2001, and has been published in "Twilight Song," "Liaisons" and "Young Voices Magazine." She holds a Bachelor of Science degree in zoology from the University of Guelph. What Is the Age of a Bull When It Can Reproduce? At What Age Should a Horse's Testicles Drop? Which Gender of Hamster Should I Get? What Reptiles Have Both Male & Female Organs?